A tourist spends the night in a derelict Spanish villa seemingly held in the supernatural grip of an eccentric butler, who resembles a depiction of the Devil she had seen on an ancient fresco. Following a bungled robbery, three violent criminals take a young woman, a middle-aged man, and a child hostage and force them to drive them outside Rome to help them make a clean escape. Bruno Baldini: There's nothing worse for a marriage than sending a husband off without his coffee. Q: What are the differences between the British VHS Version and the Uncensored Version? 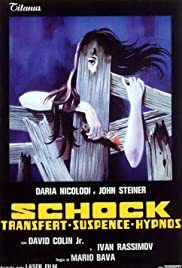 I read somewhere that this is as much a Lamberto Bava film as it is Mario Bava's. If it's Lamberto; it's one of his best, if it's Mario; it's not one of his best. Shock mostly delivers in a knockout finale that is truly terrifying. Up until then it mostly drags, with highlights that are few and far between. This is not one of Bava's visual feasts, it's more gritty looking than I expected but Bava is, as always, very capable of creating a moody and eerie atmosphere and he doesn't fail here either. If the film had a better script and a few more surprises up it's sleeve it would be a superb horror movie. The film is also bolstered by Daria Nicolodi's best ever performance, pity she didn't perform as well for Dario Argento as she did here. The fact she could act so well here was a big SHOCK for me.